We have another new writer on the Paddle Junkie crew. This time we bring in a good ole southern boy from Tennessee. Not only does this guy like to hike and camp, but he is a professional raptor trainer and handler. He ran the bird show at Dollywood and is just an all-around cool dude. Now, before anyone gets their undies in a bunch, I know we just reviewed these boots, but everyone that has tested them loves them. The crew over at Hi-Tec got it right and we all want to share. So here’s the scoop! 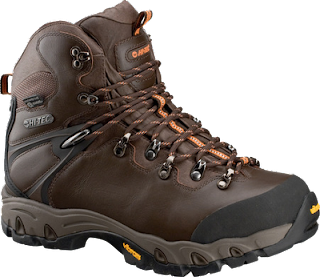 The Hi-Tec Rainier WPI Men’s hiking boot is jam packed full of all the bells and whistles you could need as a backpacker or everyday outdoorsman. The Vibram outsole will literally grip everything. This includes the frozen lakes of Siberia (aka Wisconsin) where I have recently moved. Since I moved to this snow covered tundra my old hiking boots that had performed very well over the past two years on the AP trail in Tennessee were in desperate need of retirement. I needed a pair of boots that would give great support, be extremely waterproof, moisture wicking, and double as a disciplinary tool for wife and kids (just a joke). With the Stabila-flex support on the back of the boot you can still move your foot but be assured you have to try very hard to roll your ankle in these bad boys. I have to make a big deal about the Ion-mask waterproof technology since it blew me out of the water, no pun intended. First of all, Ion-mask was originally developed for military clothing designed to repel chemical agents but Hi-Tec are pioneers in the introduction of Ion-Mask in the footwear industry! If it is good enough for our military it is good enough for me! These boots are incredibly waterproof which is perfect for hikers like myself you have to trudge through mud and snow 10 months out of the year. The E-Vent Technology is equally amazing. This waterproof membrane lining the inside of the boot is porous allowing vapor caused by sweat to pass through to the outside of the fabric without being absorbed by the fabric itself. Therefore, the boots stay dry inside and out even better than the all mighty gortex. There are a couple of cons to this boot but each one can be worked through. The rubber toe cap started peeling away on the sides due to very heavy use in the first two months. This was quickly fixed by putting a drop of glue under the rubber and letting it set. Remember, you don’t want to stitch an area back together on any pair of water proof boots since this will punch holes in the waterproof membrane. Also, this goes along with the incredible support I spoke about earlier. These boots are incredibly difficult to break in! It took 3 months of heavy use to finally tell myself that this boots were comfortable. This is partly due to the fact that the boots are made with V-Light technology. They lack a ton of padding inside the boot but once they are broken in they are very light and are a joy to hike in. The last con I could have, and I am knit picking here, was that the outsole’s upper region is painted brown it seems and after light use it started to split and flake away making me leery that I may have a pair of cheaply made boots. They have definitely redeemed themselves in my mind. Besides the worn look only adds character. If the bones are good who cares what they look like. I would definitely recommend these boots to the hiker or outdoorsman looking for a very sturdy, supportive, waterproof boot. At $239 they are priced with the big boys in the industry but would hold their own any day. Take care and Happy Hiking! P.S. I bet my grandfather wouldn’t have complained as much about hiking to school up hill both ways in the snow if he had a pair of Hi-Tec Rainier WPI Men’s hiking boots!! !